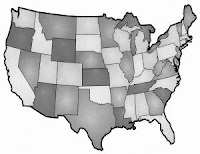 SAMHSA (Substance Abuse and Mental Health Services Administration) has published its 2007 state by state drug use report. The full report can be viewed at their site - we will examine only a few drug use statistics and try to identify what this means for the home drug test world and for the products within it - things like a hair drug test or a urine test. What we learn vis-a-vis home drug testing from this report is that drug use is concentrated among the young. For example, 8.1% of the US population over the age of 12 had used an illicit drug in the past month. The drug use is concentrated in the population aged 18-25 - 19.77% percent of people in this age bracket admitted to illicit drug use in the past month. The 12-17 age bracket rates at a 9.66% in this category, slightly higher than the overall population. 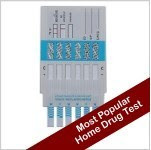 This is no doubt food for thought for someone thinking about buying a home drug test and wondering what sort of home drug testing they should embark upon. In 10 states, more than 10% of the population aged 12-17 admitted to illicit drug use in the past month. If you look at marijuana use in particular, the results are more drastic. Although 10.2% of those over 12 used marijuana in the past year, 27.7% of young adults 18-25 used marijuana in the past year. How do you find out if someone has used illicit drugs in the past month, or even abused prescription drugs? Looking at this chart, you can see that a urine drug test is unlikely to capture a full month's drug use. Marijuana stays in the urine longer than any other commonly abused drug, but that depends on frequency of use. A hair drug test on the other hand exposes a 90 day history of drug use, if the right amount of hair is submitted (an inch and a half in length is required). A hair drug test can test for 7 different categories of drugs and is FDA Approved. Judging by the statistics in this SAMHSA report, home drug testing makes sense. It can be done at home, in the safety and privacy of your own family, and responds to the high rates of drug use among youth in the USA. A variety of tests can be found here at Home Health Testing.